Drive your career towards making meaningful impact. Are you looking for a place where top talents go to take their social impact careers to the next level? We know the international development sector does not work like the rest of the market. Learn how it works! Whether you are a top executive or junior, this is where you advance your career toward meaningful sustainable development. I have enjoyed the Impactpool experience and found its content very interesting and resourceful. The Impactpool resources have more specifically helped me get my head around « job hunt » practises in the development sector. I attended several webinars and use interview samples. Articles about how to transition from private sector to development have been helpful too as well as cover letter and CV ( CARL methods) advice. Thank you again for your help. [the fellowship] was tremendously helpful, particularly your articles on tips for interview and structuring answers, as well as the video tutorial. Your interview question database also helped me prepare proper answers. International organisations in the Impact sector have different approaches while recruiting global talent. Understand how to boost your employability by mastering the recruitment process. Our Fellowship will significantly increase your chances and help you accelerate towards the meaningful career you want. We work every day to bring you more. If you are determined to advance your career in this sector, our Fellowship is a perfect match for you. We are positive you will stay with us once you realize how serious we are about getting our fellows ahead. Recurring annual payment billed once a year. Cancel anytime. Do you represent a university and want to provide students with our Fellowship? Do you represent an organization and are interested in our Fellowship for your staff? What happens once I become a Impactpool Fellow? You will get instant access to all premium content already available on Impactpool.org. Our Fellowship Community Manager will contact you explaining how to make the most of our premium service and make our advanced job matching algorithm work for you. You will be updated regularly on new exclusive content launched on Impactpool’s website. Will this content be relevant for me? Our Premium Content is guided by the area of expertise and job levels of our Fellows. Hence, our content spans across many fields of work and organisations. Whether you’re at a Junior or Senior level, Impactpool Fellowship is relevant for your career in the development sector. For how long will I have access to these services? 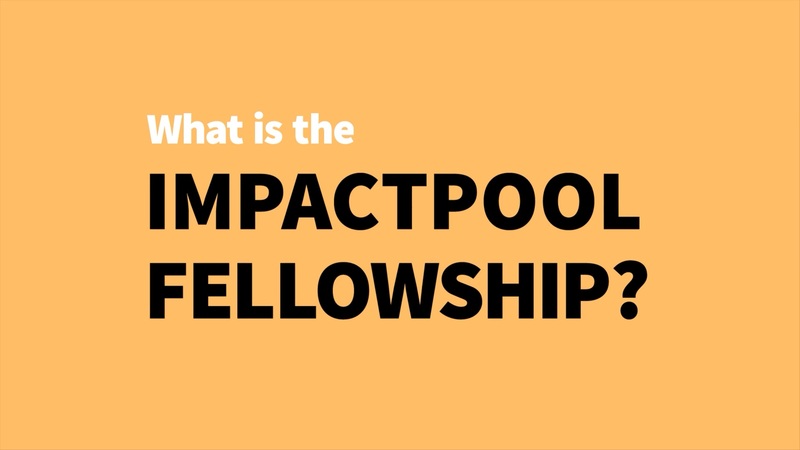 The Impactpool Fellowship offers different subscription plans. You get access to all of the above for $9.99 USD on a monthly basis, for $59.88 USD on a yearly basis and for $299 USD for a lifetime subscription plan. If you use a promotion code, that grants you a payment discount, the subscription will revert to the regular monthly/yearly fee after the promotion period ends. The subscription renewal fees are automatically charged monthly/yearly when paid by credit card. How can I cancel the Fellowship? Write to us using the dedicated service email address on your Impactpool Fellowship profile. To ensure that your subscription is cancelled in time to avoid charges for a new period, inform us of your cancellation 7 days before the next renewal date (found in your profile). We welcome all feedback and suggestions for improvement! Get in touch at any time regarding the Fellowship via the dedicated service email address on your profile. Please note that we will not be able to answer job-specific requests.